For a small boutique hotel in Argentina's far northwest Andes the Posada con los Angeles is fortunate to have an excellent restaurant. 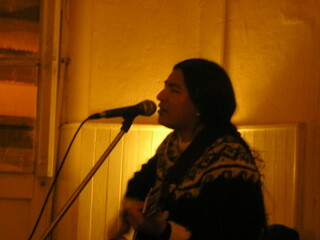 A talented staff of four create a quiet and romantic atmosphere. We dined at the Posada for four of our five nights, not the only repeat guest patrons. 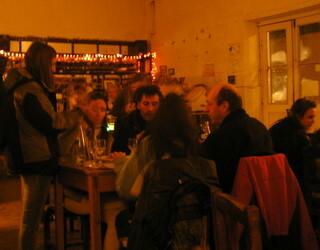 They have a limited menu, as should be expected, yet the dining room was full every evening. Highlights from the menu include an appetizer of Queso de Cabra, the delicious local savory goat cheese, on vinaigrette dressed spring greens with fresh and warm crusty bread. Squash and mushrooms soup was creamy and full bodied. Braised beef with lentils and quinoa was tender and local. 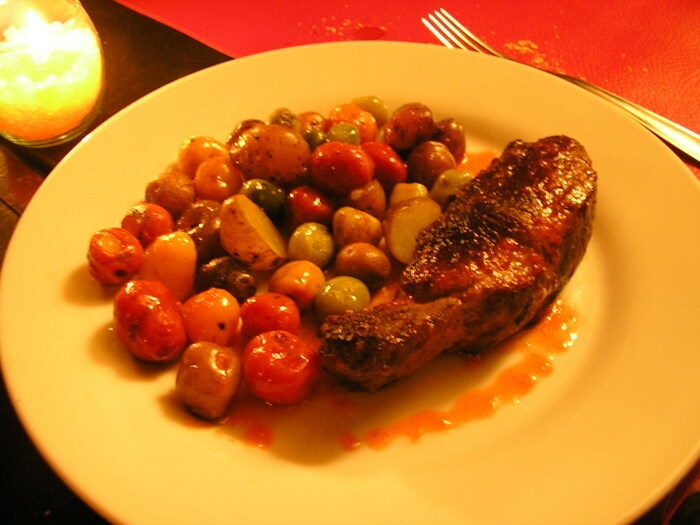 But the wood grilled llama steak with tiny multi-colored Andean potatoes was the prize dish. 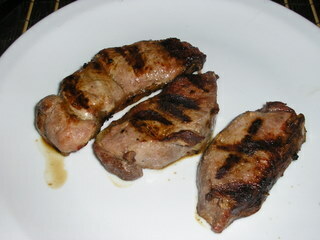 Llama, cooked properly, is as tender as veal and Andean potatoes are a visual carbohydrate delight. My only criticism was the lack of salads on the menu. This was surprising given the level of the restaurant and the availability of produce. Argentine menus are not known for their abundance of salads and vegetables, but on this menu they were non-existent. One dessert was a stunner! Mousse de cayote - a creamy mousse with the subtle flavor of cayote - a local Andean fruit from a succulent. The cayote is a slow growing dessert fruit and its wild harvest is protected. Commercially grown production still makes this a rare delight. Cayote's subtle aroma is almost rose-like. AR$22 (US$6.00). One evening, a dust storm (not uncommon in winter but this one was more severe than usual) cut all electric power to the area. The gas-fueled kitchen was right on schedule with romantic candle light flickering on the tables and glowing off the adobe walls. Our average dinner for two, with wine, came to AR$139 (US$37.00). Reservations required for both guests and non-guests - inform the front desk before 5:00 PM. Restaurant Qomer sits within an attractive courtyard of shops on Tilcara’s main street. From the outside it looks like any other small cafe, but inside is excellent neuvo Andean cuisine. 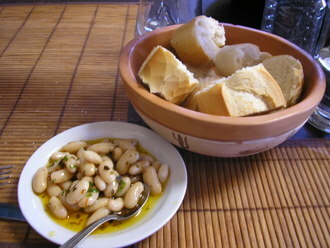 Our lunch started with bread and a small dish of fava beans marinated in seasoned olive oil - Argentine restaurants rarely serve butter, rather they bring all sorts of toppings. 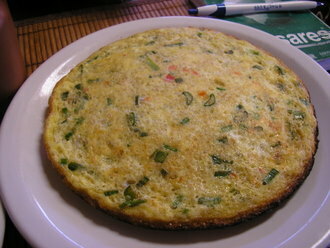 A Tortilla de Quinoa was an excellent adaptation of the Spanish egg dish substituting Andean quinoa for the traditional potatoes. It was light and the grain gave a nice crunch. 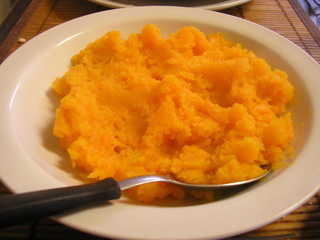 A dish of pureed squash was bursting with natural flavor. 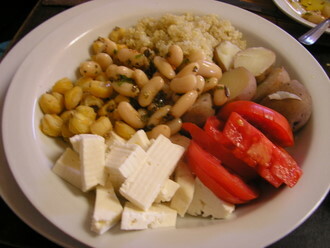 An Ensalada Norte was a generous arrangement of Andean potatoes, fava beans, chick peas, queso de cabra, tomatoes and quinoa with a side of vinaigrette. This lunch for two with freshly made ice tea, was AR$63 (US$17.00). 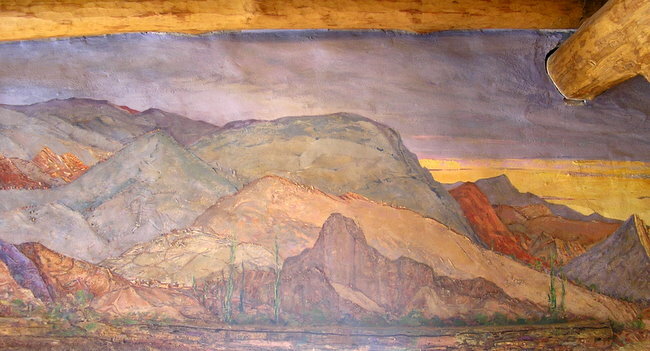 Few evenings are more pleasant than spent admiring fine art in unique local styles while listening to an excellent singer-songwriter and enjoying dinner in a top-notch restaurant. 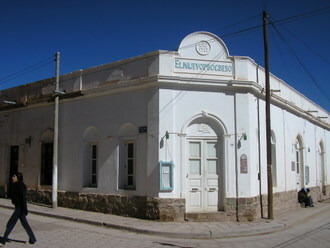 Neuvo Progresso 1917 is set in a 1917 apothecary building. Its simple white washed walls, old wood floor, firplace - burning on this chilly winter evening - and colorful mismatched old wood tables and chairs made the perfect foil for the art, music and food. 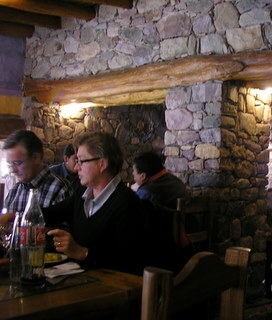 It has the atmosphere of New York Village bistro, except it’s in a small town in the Andes Mountains. 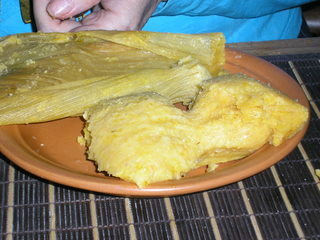 We ordered a dish of Queso de Cabra in olive oil to go with our bread, followed by an authentic Tamale, firm with corn and vegetables. 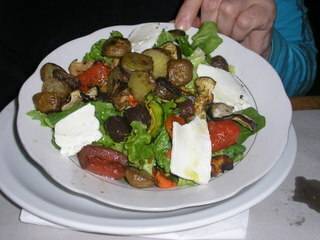 We shared a salad of greens and roasted vegetables, with queso de cabra. We each had the wine braised Cordero (local lamb) with smashed garlic Andean potatoes. 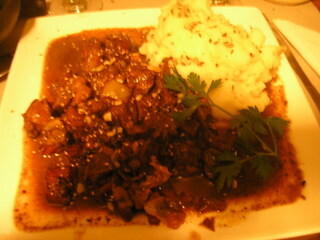 The lamb was fork tender in a deep brown savory wine sauce. We ended this very satisfying dinner with the incomparable Mousse de cayote. We shared a very good bottle of local bodega Punta Corral's 2004 Sauvignon Cabernet. The dinner for two with wine came to AR$133 (US$35.00). 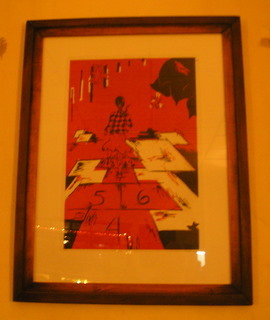 We did purchase a silk screen by a local artist, for AR$400 (US$106.00). Restaurant Los Puestos has a well deserved reputation with locals and tourist alike for consistency and good food at moderate prices. Even on an off-season weekday, the spacious series of dining rooms were full from 1:00 to 3:30 PM, and I would recommend making reservations in advance no matter when you want to dine. The interior blends exposed rock, dark wood and glass with original art and a stunning painted mural of the Quebrada along one entire wall. Even though the menu is eclectic with a variety of pasta and traditional Argentine dishes, the specialty is its Andean fare. 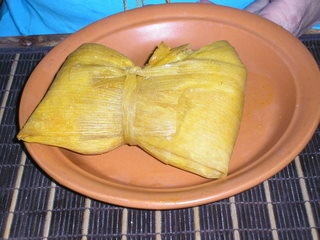 Authentic tamales, creamy humitas, thick lomita and superb wood grilled llama, lamb and goat. Their bar serves a nice selection of local beers and wines. Our lunch for two cost AR$94 (US$25).